“In the early 1900’s during the depression my father, and grandfather of my son (Richard Lamppa), worked as a blacksmith for the WPA work program. He started making sauna stoves for the early Finnish settlers who lived in the country. They were very fond of traditional Finnish saunas. He usually made the stoves out of used 30 gallon oil drums. He would cut an opening on one end of the barrel for loading wood into the stove barrel. He purchased a cast iron frame and door which was bolted to the end that had the opening. He also attached a cast iron smoke collar on top side of the barrel that lay sideways. I remember clearly how many hours I had to stand there cranking the handle of the blower of the coal fired Forge. He had straps of iron that had to be heated till they were red hot so he could then hammer them in the shape needed to form the legs of the stove. My father made many beneficial modifications to our stoves over the years and in the late 1970’s, my son Daryl and I took over the family business and started to make wood burning furnaces along with sauna stoves. We have since made numerous improvements to our product lines including using a patented wood burning process called gasification that allows for increased burning efficiency and lowered smoke and creosote build up. 1940’s Grandpa Richard Lamppa and his son Herbert Lamppa made saunas in Embarrass, Minnesota for the people of Embarrass and surrounding areas. Grandpa Richard was an expert welder. 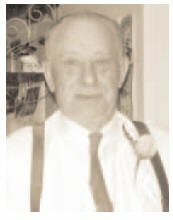 He had honed his welding skills working for the Erie Mining Company and the Duluth shipyards. Saunas were kind of a family thing in the area, and everyone wanted one of Richard Lamppa’s because everyone knew his were the best. In 2015 Daryl Lamppa (Richard’s grandson) was asked if he’d be interested in and old sauna that a lady had at her Lake Vermillion home. As they checked it out further, they discovered that it had been made back in the 1940’s by Daryl’s grandfather. Mike Salo, of Vermillion remembered the day Richard made this particular stove because Richard wrote the name “Steam King” across the front with a welding rod. The name remains to this day. It is believed that this is one of the very first Lamppa Saunas built. Now back in the possession of the Lamppa family. Daryl Lamppa who is the grandson of Richard Lamppa, and the current owner/operator of Lamppa Manufacturing (3rd Generation) was too young to be involved with sauna production that took place in Embarrass, Minnesota. 1972 – Daryl Lamppa’s first involvement with heating stoves started in 1972. Daryl and his wife Cheryl decided to build a new house. But Daryl tends to be a bit more hand-on than most of us. Daryl, his father-in-law and his father cut all the trees, and took them to the sawmill to be cut into timbers. They poured all their own cement. Cheryl mixed all mortar and Herbert (Daryl’s father) laid all the concrete block. The house construction was kind of a family affair. Daryl, Cheryl, Herbert, Eino (Cheryl’s father), Daryl’s brother Steve and his cousin Reed all helped with the construction. As winter approached there was no electricity or heat in the new home, so Daryl went to Embarrass and purchased a U.S. Steel Stove from his cousin’s General Store. Daryl said it was constructed of very thin steel. He installed the stove in the basement of the house for heat during construction. Every time he would light the stove, it would burn so hot that the entire top of the stove would glow red. With all the effort and sweat equity that had gone into the house, poor Daryl wouldn’t dare leave the house until the fire would burn down for fear the house would catch fire. He spent many long nights. 1974 – Once the house was completed, Daryl and his father, Herbert, decided to purchase better stoves made in Michigan called “Volcano.” These stoves were better, but they burned the wood too quickly. You had to re-light the fire quite often because the fire would burn out so quickly. One cold winter morning as Daryl went out the door to go to work, he noticed the snow around the house was all black. He went back in and told his wife, Cheryl, that they had a chimney fire the previous night and didn’t even know it. Daryl told his dad about the chimney fire and they agreed that they shouldn’t burn wood for heat until they could find a much safer design. This is when they decided to design their own heating furnace. 1975 – Daryl and Herbert designed and produced first Kuuma 1 furnace. Their furnace took advantage of a concept found in several Scandinavian designs. This made good sense to a couple of gentlemen of Finnish decent. Instead of the fire burning from the bottom-up, their fire burned from the front of the furnace toward the rear. This allowed them to maintain a much more even heat release and much longer burn times on the same amount of wood. This also allows the wood to burn cleaner. At the time they were working on the Kuuma 1 design, Daryl was working full-time for the Tower creamery delivering milk, and going to school in Duluth at night to finish his degree. Daryl had over 300 milk customers that he delivered to. He said back at that time, it was common to walk right into people’s homes and put the milk into their refrigerator, and sometimes while the people were still asleep. Those were much more trusting times. 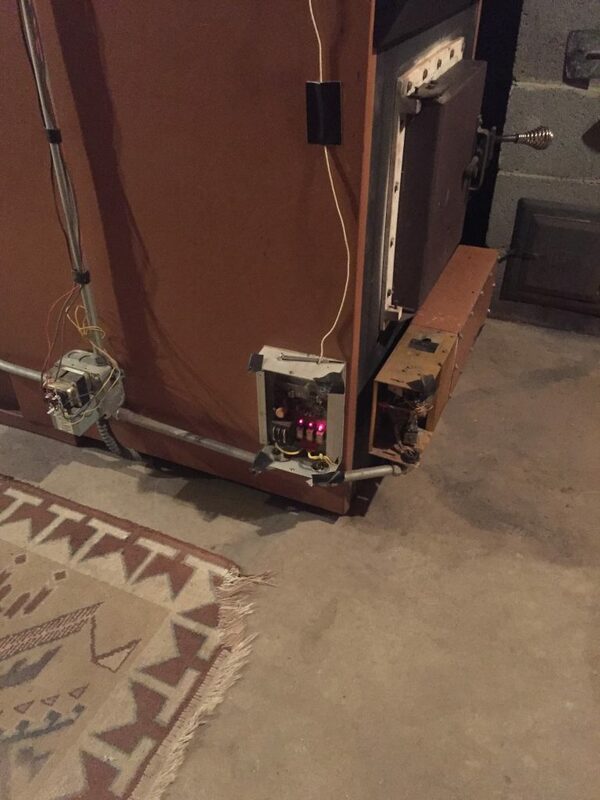 To introduce the new furnace that Daryl and Herbert had developed in the garage – they printed up a flier. Daryl delivered this flier to all 300 of his milk customers. The flyer offered an “open garage” experience to see the new Kuuma 1 stove operating. Everyone was fascinated with this new approach to a furnace and long they would burn on a single load of wood. They received several initial orders for new furnaces. Daryl and Herbert repeated the “open garage” program for a couple additional weekends. News of the new furnace began to spread by word-of-mouth and the orders continued to come in. This was the beginning of regular production of Lamppa Kuuma 1 furnaces and helped promote interest in the Kuuma wood sauna stoves. As the 1970’s oil crisis gripped the nation and drove up gas, oil and natural gas prices, many people decided to go back to burning wood for heat. The oil crisis was a great boon to Kuuma 1 furnace sales. 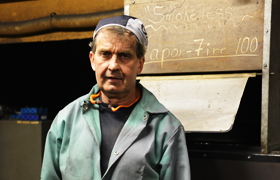 Daryl’s was manufacturing Kuuma furnaces on 2 production shifts and business was really humming. The very first Kuuma 1 stove ended up in Ely, Minnesota at the home Eino Lepisto, Cheryl’s father. He ran that furnace until the day he died. He loved his furnace. The first 300 Kuuma furnaces produced didn’t have ash pans. Customers would have to let the fire burn way down or even completely out in some cases so they could shovel the ashes out. It was a dirty job but the bigger issue was that it was a nuisance. The 301st furnace produced had an ash pan installed. Every furnace since has come with an ash clean-out and ash pan. 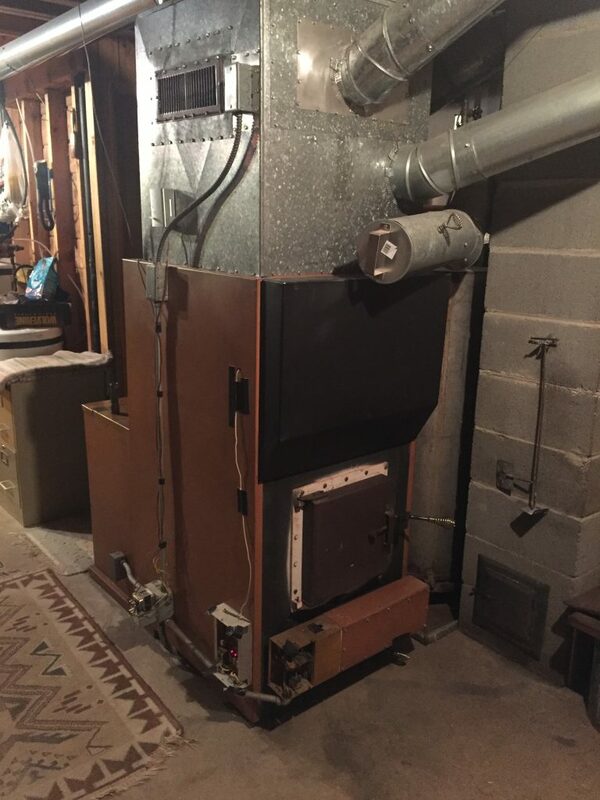 1976 – Daryl installed a Kuuma 1 furnace in his house. But he noticed there was still a small amount of smoke from the chimney. To Daryl, this meant the wood wasn’t burning at peak efficiency. So Daryl and Herbert set out again to improve on the design that would not smoke (no smoke – no creosote in the chimney). They started a new series of testing in the good old garage. There were countless iterations in attempt to find the ideal solution. They created a peep hole that allowed them to look down into the fire box to observe how the gasses were burning. They invested in a backright for testing CO2 and a special filter to measure carbon in the exhaust. The garage development and testing continued from 1977 until 1983. The first Vapor-Fire 200 were produced in 1983 (20 units). This version had eliminated almost all of the smoke, but for Daryl, it still wasn’t perfect. Daryl and Herbert agreed that it would not be possible to eliminate 100% of the smoke because there would always be a short warm-up period when you first light-off the furnace, when the unit is not up to full operating temperatures. 1984 – Furnace design continued as the larger Vapor-Fire 100 was developed. Daryl immediately went to Chicago to seek and receive the UL approval. 1985 – One of the original Kuuma Vapor-Fire (pictured above) was installed in Daryl Lamppa’s basement. It has been tinkered with over the years but is still running great! 1986 – The Vapor-Fire 200 had been sold for 3 years when Daryl decided he should seek UL approval. At the time, small heating stoves were required to obtain an EPA emissions approval. Daryl felt it would only be a matter of time before the same standard would be applied to the larger furnaces. So Daryl had the EPA tests run on the Vapor-Fire 200 and achieved outstanding results of 4 grams per hour. The standard for smaller heating stoves was to produce less than 7 grams per hour. Considering that the fire-box in the Vapor-Fire 200 was at least twice the size of the smaller stoves, the 4 gram result was quite amazing. 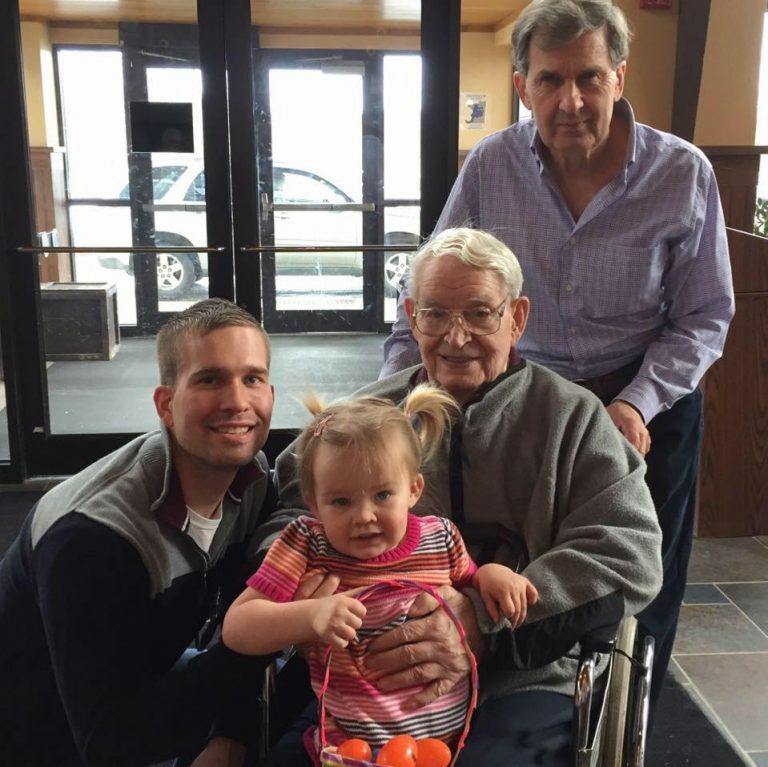 2008 – Daryl’s son Garrett took over his grandfather Herbs management responsibilities including AR, AP, Payroll, Taxes, and Marketing, making this a four-generation family run business. 2009 – The Vapor-Fire 100 wasn’t taken for the emission test until 2009. It had to achieve at least one burn that was 75% efficient in at least one of the various categories to qualify for a $1500 government tax credit. Several of the burns exceeded the 75% efficiency standard. Thus customers easily qualified to receive the $1,500 tax credits in 2009 and 2010..
Daryl decided to have both furnaces retested for emissions at Intertec in Madison, Wisconsin. Information gained from this testing helped Daryl achieve the new 2016 EPA standards. 2016 – Daryl retested the Vapor-Fire at Intertec. At this testing, the Lamppa Furnace achieved 0.093 (the standard for 2020 is 0.15 pounds of emissions per million btu’s of heat produced. 2017 – We are not aware of any other manufacturer who has been able to exceed the required 2020 EPA standard for emissions. Until someone else can catch up, the Lamppa Vapor-Fire furnaces are in a class by themselves.